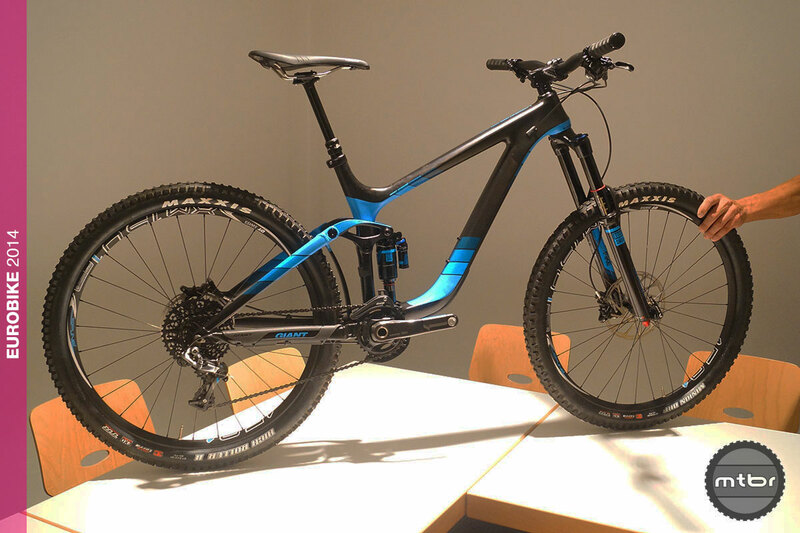 Giant’s new, top-of-the-line Reign Advanced 27.5 0 Team weighs in at 27.2 pounds and has been piloted to strong results by pro enduro racer Yoann Barelli. 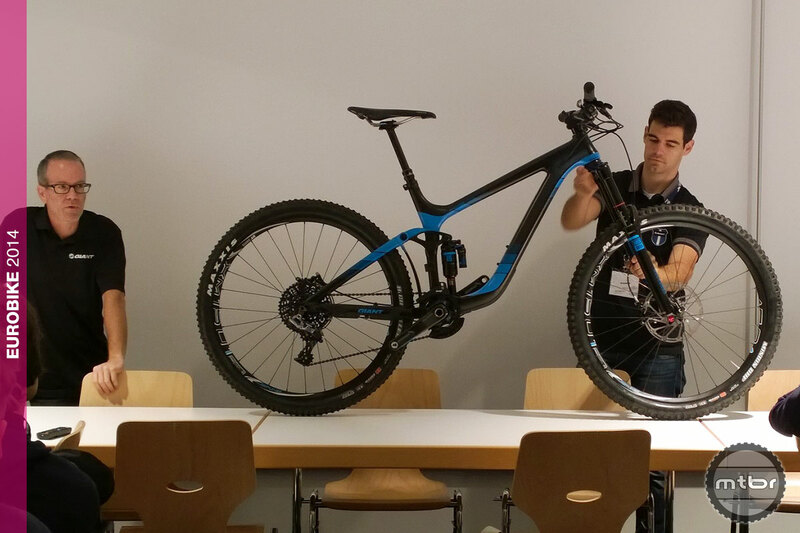 Giant kicked off Eurobike with a peek at their impressive-looking 2015 Reign Advanced 27.5 0 Team all-mountain/enduro bike. With 160mm of travel front and rear, a 65-degree head tube angle, along with short, 17.1-inch chainstays and a longish top tube, the new version is aimed at tackling tough terrain at mach speed. With heavy attendee demand to ride the new Giant Reigns, this aluminum version—along with all the other Reign demo bikes—didn’t stay on the rack long. 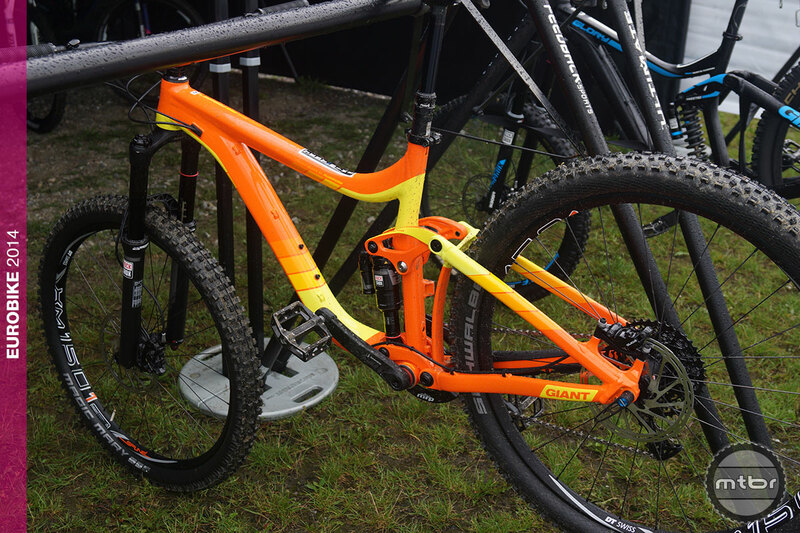 Though the bike descends like a “mini-DH bike,” according to Giant Global Off-Road Category Manager Kevin Dana, the bike comes spec’d with a custom, 46mm-offset 650b RockShox Pike to help fight front end flop when the bike is pointed uphill. It’s also got travel adjust, allowing it to be dropped to 130mm if the conditions demand. The Reign Advanced 27.5 0’s spec highlights includes an MRP chainguide in conjunction with a SRAM XX1 drivetrain (top and bottom left), a RockShox Monarch Plus DeboinAir RC3 shock (top right), and SRAM Guide RSC brakes (bottom right). The new Reign Advanced 27.5 0 Team has a US MSRP of $8,250 but also comes in more economical step-down versions, including the $4,750 Reign Advanced 27.5 1, and the aluminum Reign 27.5 1 ($5,975) and Reign 27.5 2 ($3,400). The new Reigns should hit dealers in the late September or early October. 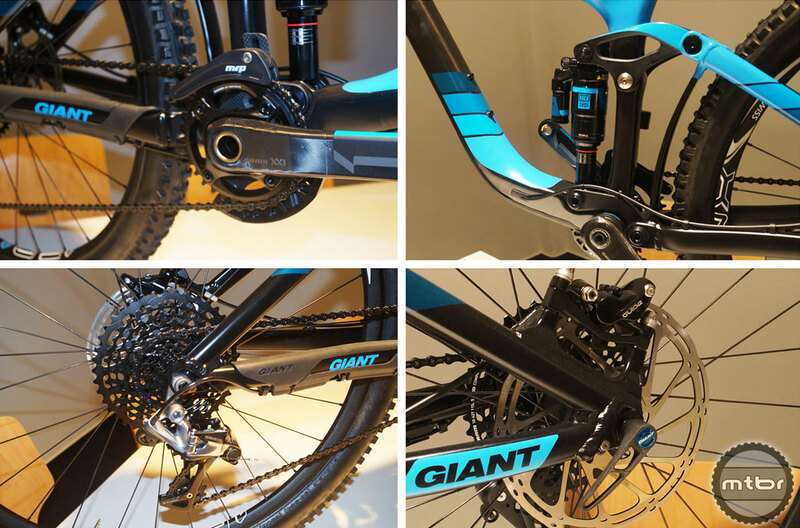 For more information visit giant-bicycles.com. The PF BB is all about cutting weight, and as long as the installer knows what they are doing, it’s easy to install and easy to disassemble and clean. The only problem I can see in the PF BB is user error, and it’s always associated with to much pre-load, or not enough. I have installed several and they are still working how they should. Giant was one of the pioneers of the tapered headtube. The “Overdrive” head tube IS the standard head tube we all enjoy. What you are reffering to is “Overdrive 2” which is their proprietary set up. The Reign possesses the now standard steer tube. The bike industry says …. ” If we build them ,they will come”. Then we’ll feed them a bunch of bs about R & D and charge um up the Ying Yang. I’d love to know what the mark up is on these carbon bikes that are all made abroad anyways! No thanks, money doesn’t grow on trees. Believe me I agree that some of the prices are astronomically high. However, carbon frames are extremely expensive to develop and manufacture. There is no reliable automation process therefore they are hand layed. Each mold for each frame and size runs north of $175,000 to manufacture. Not to mention prototype, design revisions, paying engineers to conduct initial structural integrity analysis, and any other costs incurred. Before even producing one frame for the consumer any given bike company has invested a great deal of capitol to release a product consumers will buy.